Juanita Cole Nanney, affectionately known as “Aunt Neet,” age 91, of Miami Lakes, FL, passed away October 24, 2018. Juanita was born April 16, 1927 in Rutherford County, NC, the daughter of the late Roy and Lonamae Honeycutt Cole. She was a graduate of Gardner Webb College. Juanita and her husband, Louis Nanney, moved to South Florida in the early 1960’s. They became charter members of North Palm Baptist Church in Hialeah, FL. The fellowship hall at the church is named in their honor. Juanita established the North Palm Baptist Church kindergarten program in 1964 and was its director for 37 years. Because of her profound impact upon the church and school, Juanita Nanney Day is celebrated annually at North Palm the first Sunday in June each year. Juanita was preceded in death by her beloved husband Louis Nanney, son Hugh Cole, and brother Vernon Cole. Juanita is survived by her son Michael Cole, his wife Dayna Turner Cole, and granddaughter Jaymie Ilise Cole of Pembroke Pines, FL. She is also survived by her daughter-in-law Laura Cofield Cole and granddaughter Mary Ellen Cole of Griffin, GA as well as her dear friend Joyce Barnette of Miami Lakes, FL. Graveside services will be held at 11 am November 3, 2018 in the Eternal Hills Memorial Park in Forest City, NC. A Celebration of Life for Juanita Cole Nanney will be held Saturday, November 17, 2018, in the sanctuary of North Palm Baptist Church in Hialeah, Fl. 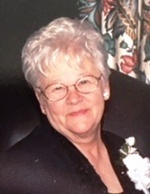 Juanita Cole Nanney’s loving heart will be greatly missed by all those who were blessed to know her. Flowers will be accepted at the service at North Palm Baptist Church or donations may be made to North Palm Baptist, 7801 NW 178th St. Hialeah, FL. 33015, in honor of Juanita.